Think first about what exactly you want to say. If the article is unsoliciataed, contact the Editor with your pitch. Sin cannot guarnatee publication of unsolicitated articles. Why and how did it happen? News articles must follow the Inverted Pyramid Model (see below) and not a traditional story form which has a beginning, middle and end. Remember to keep sentences in Subject-Verb-Object form. This allows the reader to understand the meaning instantly. Use active verbs not passive verbs. An active verb is a verb which describes the subject as actively doing something. e.g. the teacher teaches the students. A passive verb is a verb which describes the subject as sitting passively as someone else does the action. e.g. the students are taught by the teacher. Thus, A hit B describes the event more concisely than B was hit by A. A short, simple sentence will get your point across much more effectively than a long, showy sentence. Do not use clichés or metaphors. Be clear and concise. Do not waffle. Quotations from relevant persons add colour and authenticity to the story. When using quotation marks the quote must be verbatim (word for word). Do not paraphrase in quotation marks. If you are unsure check with the person you are quoting. Never describe the news as good, exciting, bad, shocking etc. Let the reader decide how they feel about the news. This is more acceptable in opinion articles as you are actually expressing an opinion. Only write from one, objective point of view. Give both sides of the story, but remain impartial. Remain objective at all times. If you feel so strongly about something that you cannot remain objective ask to have the article assigned to someone else. A good headline is a challenge to conjure. The purpose is to inform the reader and draw their attention. Try to encapsulate the piece in a short and snappy line. If you give too much away, you risk losing the reader’s interest. Equally, don’t be too vague. Time permitting, never submit a first draft. Leave it for a day or two before reading it again. You’ll probably find a number of changes that can be made. Read the piece aloud before submitting it. You should not have to pause for breath in the middle of a sentence or stumble over phrases. If you do, you need to make revisions. When you read back over the piece, see how many unnecessary words you can cut. 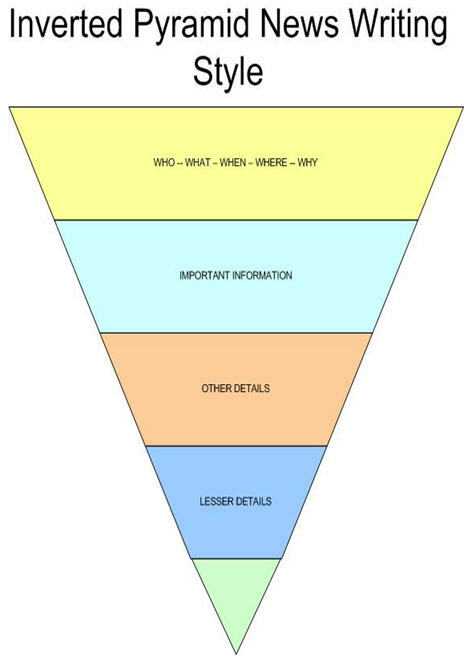 The Inverted Pyramid is the most used style of news writing and can be divided up into three sections. The information isarranged in descending order with the most important information at the top and the least relevant information at the bottom. The first section or paragraph of a news story answers the Who? What? When? Where? Why? and How? questions. Itprovides the reader with the most crucial facts about the story and also includes any information that the reader must have to understand the story. The lead should sum up the entire story in less than 50 words. The second section is the body of the story. This section includes additional and supporting information, as well as interviews and quotes from the relevant people. The body of the story should fully explain the information presented in the lead. The concluding section is made up of the least important details to the reader. It also means a reader who simply scans the beginning of the story will have obtained all the information they need without having to read the entire article. This model is essential in news writing as it allows the editor to remove content from the bottom of the article without removing the essential information. Keep the tone somewhat lighter than for news items. Remember the deadline for Features is earlier than News. Clear the content with the Editor and request a word count before proceeding. Though features are more light-hearted than news, they must still be factual. The rules of libel still apply. Do not use swearing in place of humour. In addition to the headline you may include a one line introduction. Headline: Eating disorders on the rise in NUIG. Intro: Lorraine O’Hanlon investigates why a growing number of students develop an eating disorder at university.